Another Norwegian cruise ship has sailed into the shores of the Virgin Islands for the very first time. Pictured is the Norwegian Breakaway as it made its inaugural call to the port of Road Town today, December 4. Minister for Communications Honourable Mark Vanterpool presented a plaque to Captain Mikael Hilden in commemoration of the occasion. 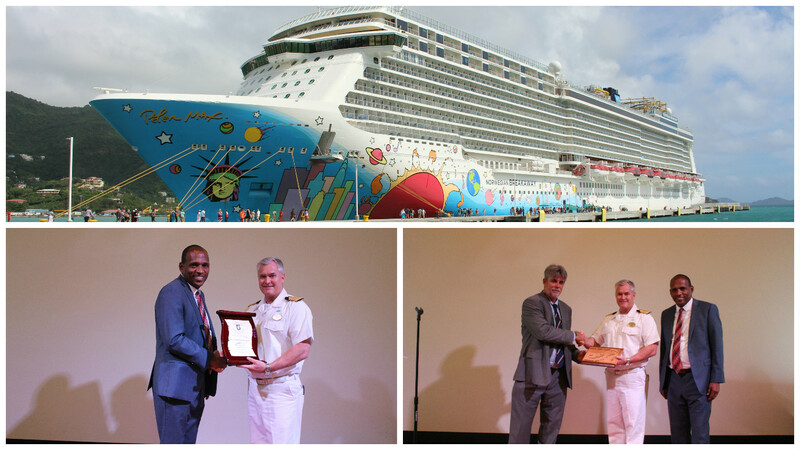 Norwegian Cruise Line (NCL) also received a plaque from its agents Island Shipping. Norwegian Breakaway is the fifth NCL ship to berth at the newly expanded pier and will return in January 2016. The ship carries about 6,500 crew and passengers.